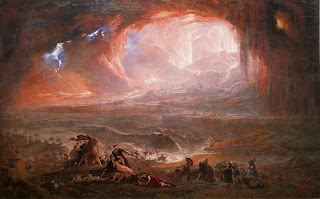 Mount Vesuvius erupted on this day in AD 79, burying the Roman cities of Pompeii, Herculaneum, Oplontis and Stabiae and causing the deaths of thousands of people. An eyewitness account of the eruption, in which tons of stones, ash and fumes were ejected from the volcano, has been left behind for posterity by a Roman administrator and poet, Pliny the Younger, who described the event in his letters to the historian Tacitus. Although there were at least three large eruptions of Vesuvius before AD 79 and there have been many since, the disaster in August AD 79 is considered the most catastrophic volcanic eruption in European history. Mount Vesuvius had thrown out ash the day before and many people had left the area. But in the early hours of the morning of August 25, pyroclastic flows of hot gas and rock began to sweep down the mountain. The flows were fast moving and knocked down all the structures in their path, incinerating or suffocating the people who had remained. 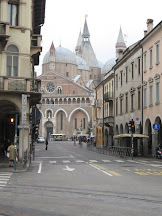 Pliny noted there were also earth tremors and a tsunami in the Bay of Naples. The remains of about 1500 people have been found at Pompeii and Herculaneum (Ercolano) but it is not known what percentage this represents of the overall death toll. Pompeii dates back to at least the seventh century BC and came under Roman rule around 200 BC. The city was almost completely covered after the eruption but the upper floors of some of the buildings stuck out from the rubble. 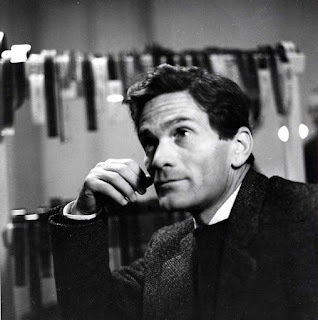 These were looted by local people over the centuries until eventually the city was forgotten. Engineers rediscovered it while digging an aqueduct in the 17th century. The first organised excavations began in 1748 and the site soon became an attraction for wealthy Europeans on the Grand Tour. After AD 79, eruptions occurred at a rate of one or two every century, culminating in a very busy period between 900 and 1073 in which there are records of eight eruptions. After 1150, the volcano became relatively quiet for almost 500 years, with activity so infrequent that vineyards and shrubbery covered the whole mountain. But in 1631 the peace was shattered by a major eruption, burying several villages under lava flows and resulting in many casualties. After that, Vesuvius continued to erupt every few years. 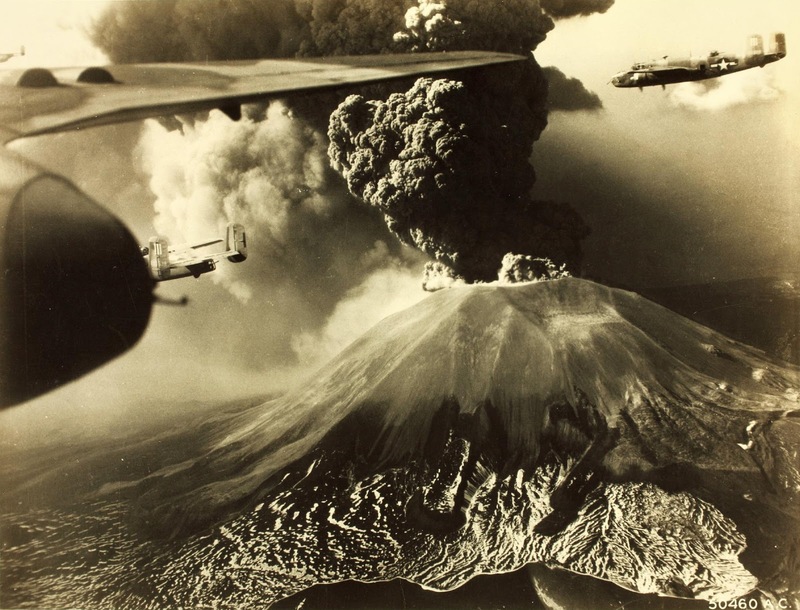 More recently, an eruption in March 1944 destroyed three villages and about 80 planes belonging to the US Army Air Forces, which were based at an airfield close by. American military personnel took photographs of the eruption, which have been useful for experts to analyse. Since 1944 Vesuvius has been uncharacteristically quiet, although it is constantly monitored for activity and an evacuation plan is in place. Experts believe seismic activity would give them between 14 and 20 days notice of an impending eruption. 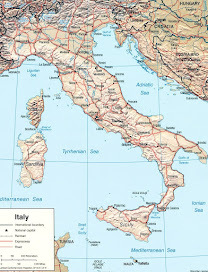 The volcano remains a concern because of the same geological factors that make the Italian peninsula so prone to earthquakes, as has been confirmed so tragically this week in the Apennine mountains north of Rome, with the destruction of the town of Amatrice and other communities. 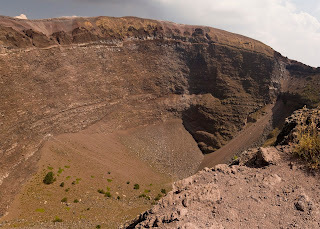 Tourists can visit the volcano inside Mount Vesuvius National Park, which was created in 1955. The crater is accessible to visitors and there is a road to within 200 metres of it, but after that the ascent is on foot only. 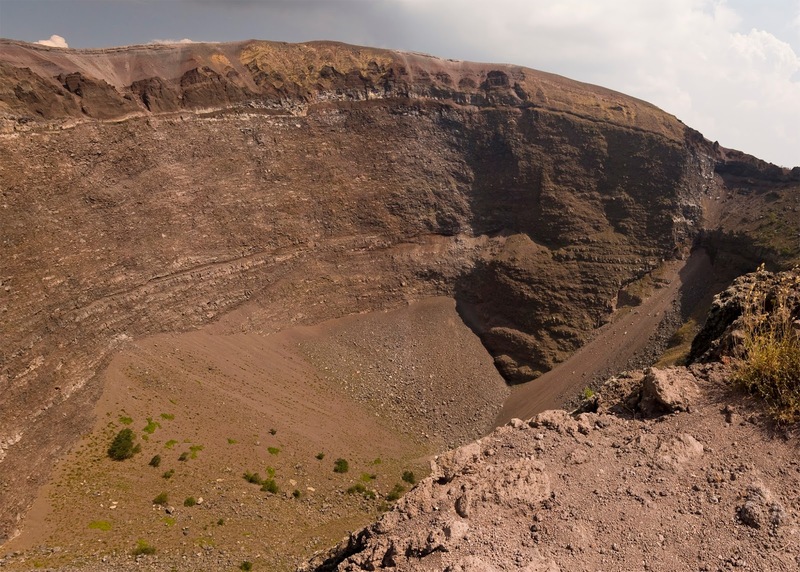 The crater is about 200 metres deep and has a maximum diameter of about 600 metres. The climb is said to be well worth it because the view takes in the entire coastline from the Gulf of Gaeta, some 84 kilometres to the north, to the Sorrento peninsula. 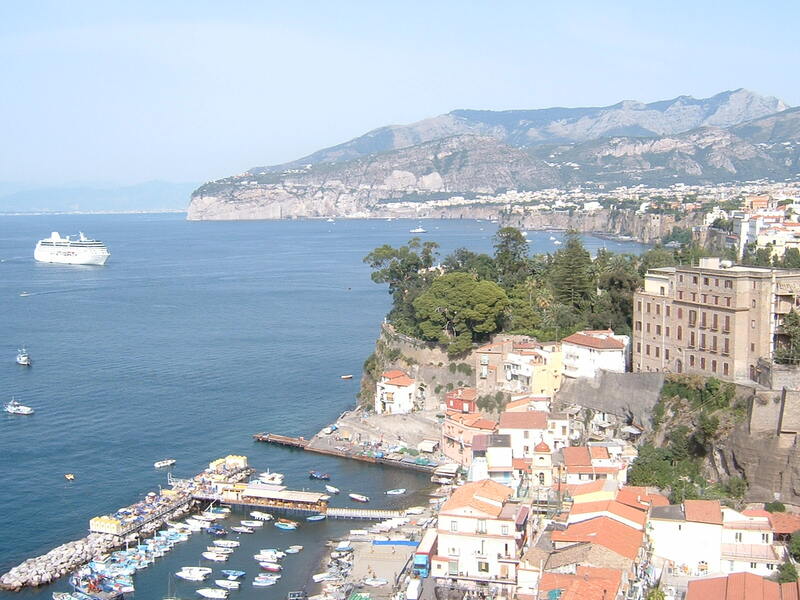 Visitors can take the Naples-Sorrento line of the Circumvesuviana railway and get off at Ercolano station, from where a shuttle bus runs to the park. There is an observatory, a museum, a visitor centre, a restaurant and a shop where you can buy Lacrima Christi del Vesuvio, the wine made from the grapes grown on the volcano. You have to sign up for a guided tour to actually get close to the crater. One of the most popular tourist attractions in Italy, gli scavi - the excavated ruins of Pompeii - show us what daily life was like in a Roman city, even down to what was sold in the shops and how people decorated their homes. A large number of important artefacts have been unearthed on the site in the last 250 years since excavations began properly. 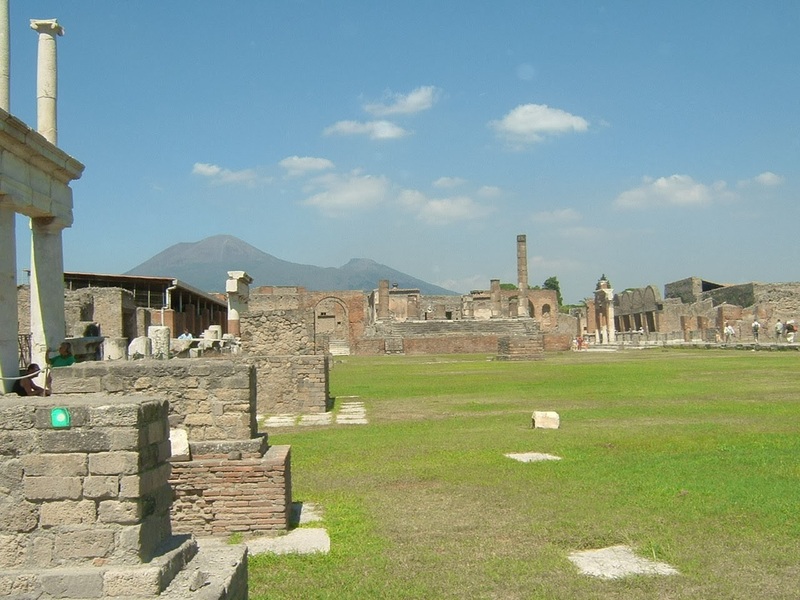 To get there take the Circumvesuviana railway and get off at Pompeii Scavi-Villa dei Misteri station. 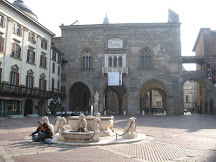 It is a short walk to the main entrance of the site in Piazza Porta Marina. From there walk along Via Marina to il Foro Civile (the forum) where orators addressed public meetings and law courts were held. Along Via del Mercurio there are interesting houses, including Casa dei Vettii, where there are well preserved wall paintings. Along Via dell’Abbondanza are the remains of shops, a tavern and even a brothel. At the end of the street you will find the main anfiteatro (ampitheatre). 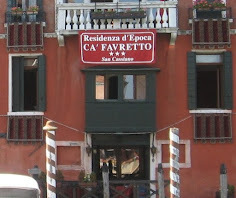 There is a self service bar and restaurant near the Tempio di Giove. The excavations are open daily from 8.30 to 19.30 during the summer and 8.30 to 17.00 between November and April.